Situated on the south coast of Cornwall Minack is the most dramatic setting of any of the gardens covered in this regional study. Minack is Cornish for ‘rocky place’ and until 100 years ago it was just another headland cliff. The arrival of Rowena Cade transformed this cliff into a remarkable working theatre, a stage for awe-inspiring performances in front of the epic backdrop of the Atlantic Ocean. As well as producing wonderful theatre, Minack is home to exotic rockeries full of salt tolerant succulents that thrive in the sub-tropical environment. The bright and amazing plants that live both in the upper tiers and in the new garden on top of the theatre are a must for both children and exotic plant lovers. 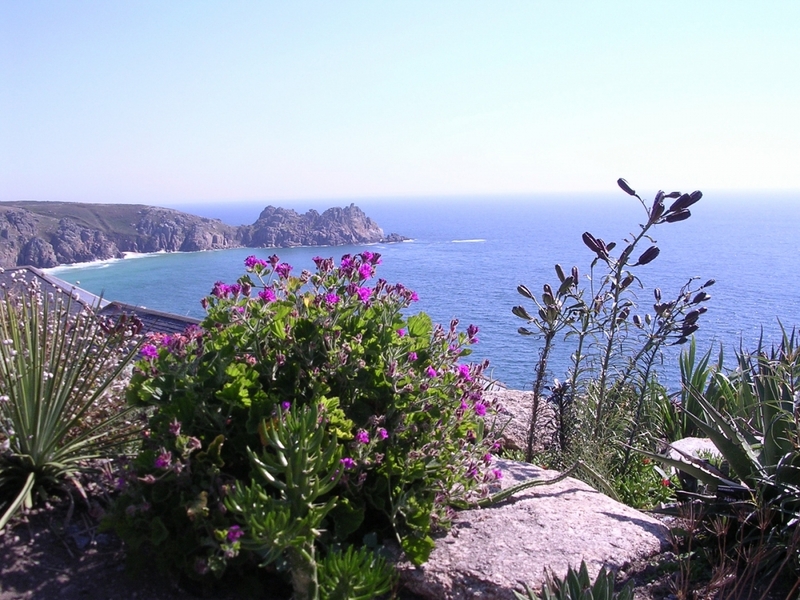 In addition to being home to spectacular theatre, Minack has amazing cliff top views and many picturesque walks can be taken in the local area, only a short distance from Lands End. For those who prefer a more relaxing approach, beautiful and sandy Porthcawl beach is within a stones throw of the theatre. Rowena Cade was born on the 2nd August 1893 and in the early 1920s she bought the Minack headland for £100. Rowena devoted her time to theatre, specifically the creation of costumes and sets for her family and friends. A successful performance of Shakespeare’s ‘A Midsummer Night’s Dream’ in a local meadow inspired Rowena’s theatre group, proving that theatre performed outside could work. It was decided that ‘The Tempest’ should be the next play performed and that Cade’s cliff-top garden would be the ideal place for this new venture. Rowena Cade wondered if she could carve a theatre into a cliff side gully above the ocean. It took a team of two craftsmen and Rowena herself six months to carve a simple theatre out of the rocks. The first performance of the Tempest, lit by car lights and the moon, was so magical that it received a rave review in The Times. The Minack theatre was born. Granite was cut by hand from local tumbled boulders and made into seats and used as a border to a grassy stage. All this work was carried out high above the Atlantic Ocean, but luckily a wheelbarrow was the only casualty. During the Second World War, Minack headland was used as a gun post and coils of barbed wire blocked off the theatre which suffered from erosion and lack of use. In the 1950s Rowena Cade invested her own time and money to rebuild the theatre. She resorted to inventive approaches, once carrying twelve fifteen-foot beams from the beach to the theatre by herself. Visiting customs officials decided that the beams couldn’t possibly have come from a nearby wrecked Spanish freighter because such a slight woman could not possibly have carried them the distance. All available materials were utilised, the beams were used to create some dressing rooms for the players and the abandoned gun post was converted into the theatre ticket office. Unable to afford granite, Rowena fashioned much of the theatre out of cement made from sand fetched by hand from nearby Porthcurno beach. She used the tip of a screwdriver to etch into the hardening cement, and her handiwork can be seen today in the intricate Celtic designs on almost every surface of the theatre. Until her mid 80s Rowena Cade financed and worked on the theatre, every year covering its footfalls and losses so the theatre could continue. Rowena died aged 89, leaving behind more ideas and sketches on how the theatre could be covered when it rained that have not yet been implemented. The theatre today is a wonderful setting for the 17 different plays held each summer, from Terry Pratchett to the timeless work of Shakespeare. The theatre now has balconies, a modern dressing room, lighting and surround sound. 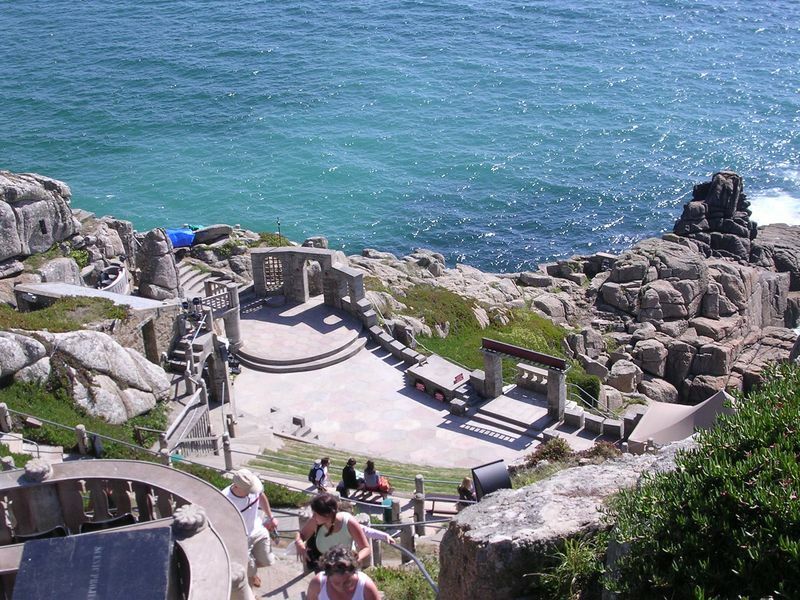 The Minack Theatre Trust offers high quality theatre and actively looks to offer the venue as a stage for the stars of tomorrow. Rowena Cade’s 1930s Minack gardens were vivid and unique, and this theme is carried on today in the rockeries around the theatre. Salt tolerant succulents thrive in the sub-tropical conditions and provide an interesting break for those waiting for a performance or just wishing to visit. Purples, yellows, pinks, reds and blues can be found in the gardens. In the new garden there is a fine collection of fascinating cacti, ferns, yuccas and other exotic plants. There is a wide selection of aloes including Aloe Whippini, Aloe melanacantha, and Aloe dyeri and pathways allow visitors to examine these outlandish species. This is a special and unique site providing the opportunity to visit a sub tropical garden on one of the most westerly edges of North West Europe. Minack is famous for it’s cliff-side theatre. Check website www.minack.com for events listing. WC: Situated by the ticket office with full disabled facilities. Parking: There is an ample free car park. Disabled parking is available. Accessibility: Wheelchair access to the lower parts of the theatre is impossible due to the number of steep steps. However, access to the upper garden is possible and the design of the theatre means the most breathtaking views are had from the top. Dogs are permitted during day visits but not for theatre performances, guide dogs excepted. Many free leaflets upon entry. An information centre by the ticket office details the history of Minack and its founder Rowena Cade through exhibits and a short film.